or we can build on site. Also available in kits for the do-it-yourselfer. 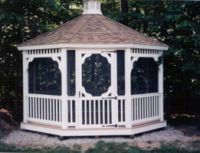 All of our gazebos are constructed of either pressure treated pine or vinyl. They may be treated with a wood preservative or painted. We offer a selection of spindles on the railings, and carry many sizes (including extra large gazebos). If you desire, your new gazebo may be screened or have benches in it. Gazebos are a beautiful enhancement to your yard and may be used for weddings, picnics, long summer nights or any of your memorable occasions. They are available in various shapes such as square, rectangle, octagaon, and oval. You can choose from different finishes such as vinyl or pressure treated wood. Each style offers a variety of options available, including a range of sizes and colors (shingle colors). Customers are responsible for accessibility, site preparation and any required permits. Please stop by our outdoor showroom or give us a call for more details and prices. Check out our FAQ page for information about delivery and setup in the Maryland, Virginia, West Virginia and Pennsylvania region. 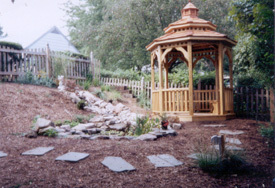 Octagon Gazebos are available in 8', 10', 12', 14', 16', 18', and 20' sizes. Comes in wood or vinyl. Choose from a variety of options. Oval Gazebos are available in wood or vinyl and come in a variety of sizes 8'x8', 8'x12', 8'x16', 10'x10', 10'x12', 10'x14', 10'x16', 10'x18', 12'x12', 12'x16', 12'x20', 14'x24', 14'x28', 14'x32'. Choose from many options. 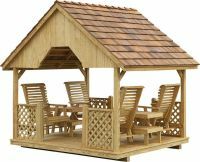 Rectangle Gazebos are available in wood or vinyl and come in a variety of sizes 8'x8', 8'x12', 8'x16', 10'x10', 10'x12', 10'x14', 10'x16', 10'x18', 12'x12', 12'x16', 12'x20', 14'x24', 14'x28', 14'x32'. Choose from many options. Large Pavilion Style Gazebo 20'x40' Rectangle. Wood and Vinyl Available in a variety of sizes: 16'x16', 16'x20', 16'x24', 16'x28', 16'x32', 20'x20', 20'x24', 20'x28', 20'x32', 20'x36', 20'x40'.Choose from many options. Shown with Asphalt Shingles, Cupola, and 2 extra doorways. Large Dodecagon Park Style Pavilion Gazebo 20'x40' Rectangle. Wood and Vinyl Available in a variety of sizes: 20', 22', 24', 26', 28', or 30'. Choose from many options. Gazebos with Gliding Chairs are available in a variety of shapes and sizes. Comes in wood or vinyl. Choose from many options. 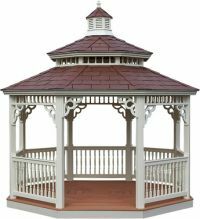 Vinyl Gazebos - white with Cupola are available in a variety of shapes and sizes. Comes in wood or vinyl. Choose from many options. 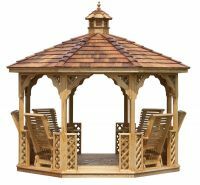 Vinyl or Wood Octagon Gazebos with screens are available in a variety of sizes. Choose from many options.